US Secratary of State John Kerry, spent most of last week shuffling between Israel, Egypt, Turkey, and Qatar, to try to bring about a halt to the military action going on Gaza. 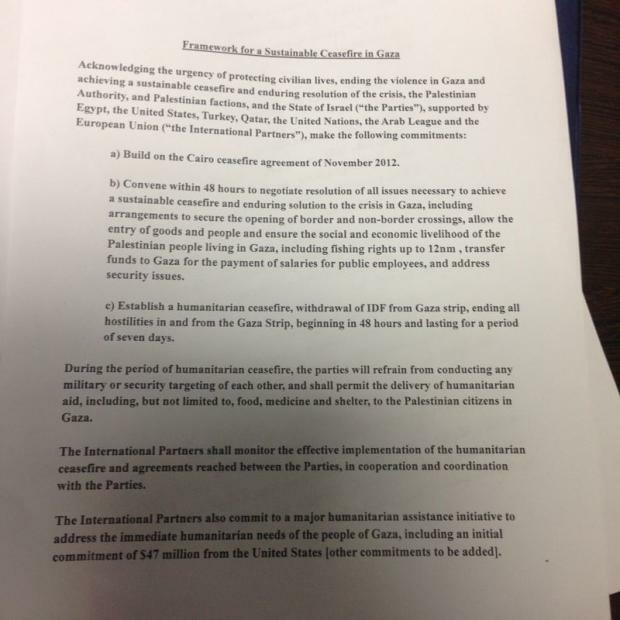 He presented this leaked document (as published in Ha’aretz, Middle East News, and other news sources) as a draft proposal, to the Israeli government for a cease fire. The Israeli Cabinet rejected it out of hand, unanimously by a vote of 8-0. The Israelis felt that the plan unprecedentedly upgraded Hamas to an equal level as Israel and other mentioned parties. It also answered many of Hamas’ original demands as put forth by the Qataris and Turkish intermediaries, but failed to mention the securities offered Israel in the original Egyptian proposal. The Palestinian Authority had also expressed dismay that the original Egyptian plan hadn’t been used as the framework for this new proposal.